Complete with 18 pcs. of MaytRx wallstones, 6 pcs. of Stretcher Stone, 4 pcs. of Column Cap, 8 pcs. of Cambridge Double-Sided Caps, one 23 in. squared x 12 in. deep metal insert and installation instructions. Available in Split Face or Renaissance. Shown with optional Cambridge Barbeque & Fire Screen. 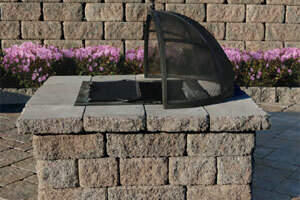 Optional grate insert turns Fire Pit into BBQ.